When I arrived to Buenos Aires, I was excited to be in one of the world’s top capitals for street art. Before my trip, I’d read about how the city’s relaxed stance towards graffiti had turned Argentina’s capital into an attractive mecca for international street artists. Plus, I was beyond thrilled when I learned that Italian muralist Blu, one of my favourites, had done a few pieces in Buenos Aires. Looking for street art around trendy Palermo was easy enough. On one of my walks around the area, I stumbled upon a mural by Triangulo Dorado for the first time. This art collective was formed by three friends who’d been painting together since 2007, creating murals with a recognisable style that mixes darker colours, geometrical shapes and poetry. Just yesterday, they announced that they’re going their separate ways to the dismay of their many fans; although it seems that they’ll continue painting, just not together anymore. 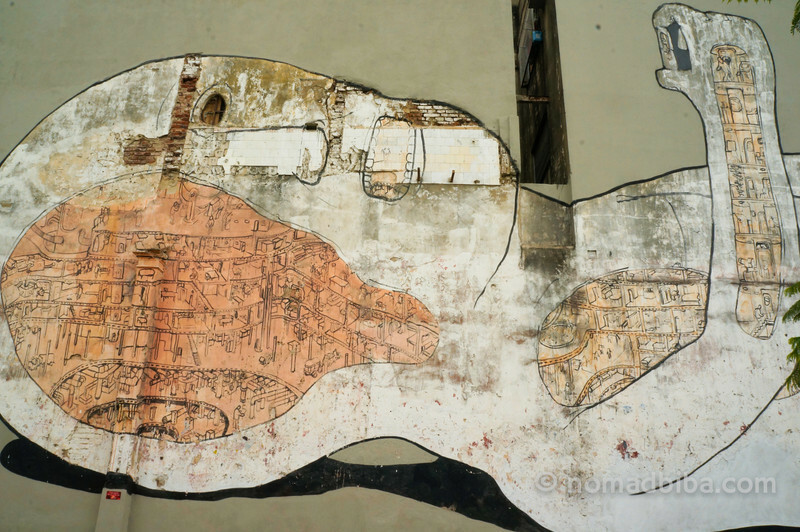 San Telmo is also a good place to see street art in Buenos Aires. There, I saw a few pieces by Colombian artist Malegria, a street artist from Bogotá who now lives in Argentina. His works usually feature fantastic characters made of basic lines and painted in bright colours. But street art in Buenos Aires is not limited to the most visited neighbourhoods; there is much more to be found off the beaten path. The problem is that Buenos Aires is massive and that not all neighbourhoods are safe to be walking around taking photos with your nice camera. So I figured that this time I needed help, if I really wanted to see more street art besides the obvious. And that’s how I decided to go on my first ever street art tour. A mutual friend put me in touch with Matt Fox-Tucker, a British expat who runs the Buenos Aires Street Art blog and who is very involved in the local street art scene. In 2010, he coauthored the book Textura Dos: Buenos Aires Street Art and today he shares his expertise by running street art tours in Buenos Aires. Since this was my first tour, I wasn’t sure about what to expect; but it turned out to be a very positive experience. It was great to have someone who knows a lot about street art giving some background information about the local scene, the artists and their works. Those details add a different perspective to what you’re looking at. 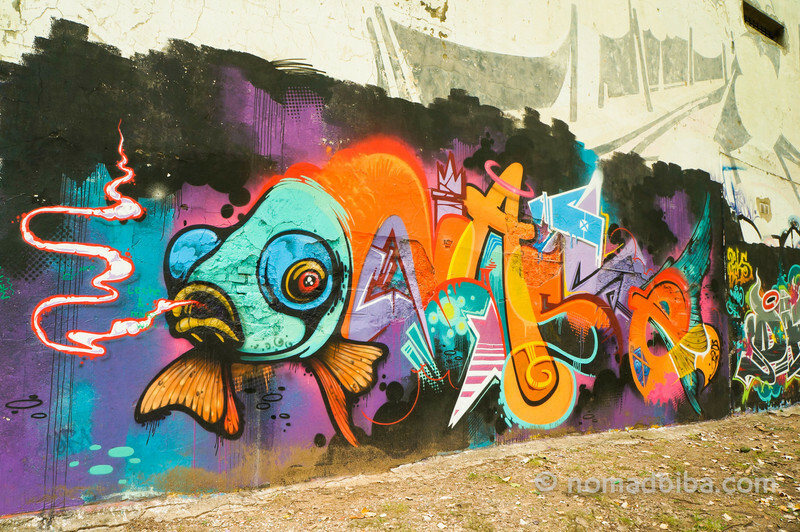 During the tour, I learned about artists I didn’t know before; like Nase, a Dutch artist who relocated to Buenos Aires and paints colourful murals with relaxed typography (see the photo with the fish, above). We also came across a mural with a strong social message (pictured above) which references to a controversy with a paper mill, by local artist Grito. Almost at the end of the tour, we saw the mural below by Peruvian duo Entes & Pesimo; who were responsible for launching the Latir Latino street art festival in Lima, featuring only Latin American artists (BTW, I’m very excited to check these murals out when I get to Peru!). We finished our urban exploration at a local bar, with a discussion of Argentinian politics over a cold beer. It was the perfect way to spend an afternoon, and I really recommend this activity if you are traveling to Buenos Aires. 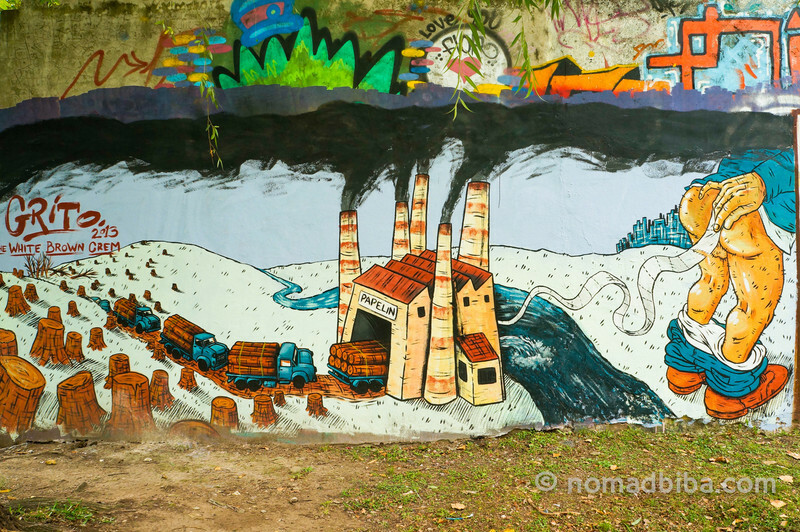 If you’d like more information about the Buenos Aires Street Art tour, check out their site. 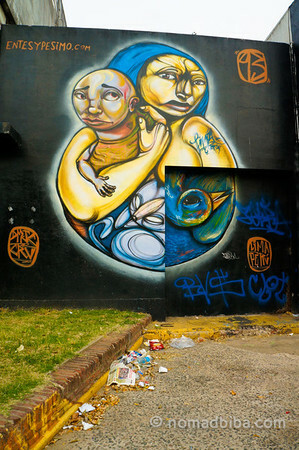 For more street art photos from my trip to Buenos Aires, check out my gallery. Have you visited Buenos Aires? Did you enjoy the street art? Which were your favourite artists/works? Let me know in the comments below! Wow! I’m speechless. 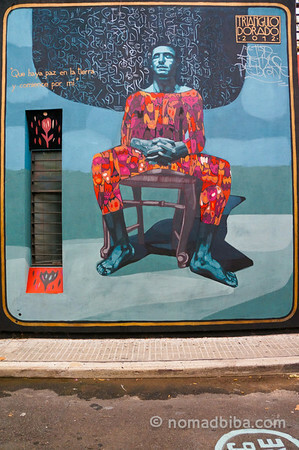 I’m wandering why I haven’t been to Buenos Aires yet considering is such an amazing place for street art, silly me! The tour looks like the kind of activity I’d definitely do, I like going around on my own and discover things by myself, but when you get to learn about the artists too it’s worth being guided. I was also blown away by it, Franca :) It was a great introduction to street art in South America as well; there’s so much going on here in terms of graffiti, it’s making my trip a complete joy. Thanks for stopping by! Love your pictures! Some great founds! I love street art! Thanks so much Marysia :) So far I’ve been really impressed by the street art in South America; stay tuned for my upcoming posts about street art in Santiago and Valparaíso in Chile, and Cochabamba in Bolivia. Thanks for visiting! I”m personally a big fan of cities. But even for me, the daily grind of city life can all get too much. How amazing to be able to walk around and see all of these bursts of colour on the city streets – an uplifting city experience, I would imagine. WoW very colorful street art. Looks like a very interesting tour and I love the photos. check it out! hope you like it! and yes, buenos aires is a great place for street art! be welcomed! Follow nomadbiba's board Argentina on Pinterest.